The Proteas Women beat the England Women by seven wickets with more than four overs remaining in the first ODI of their winter tour. 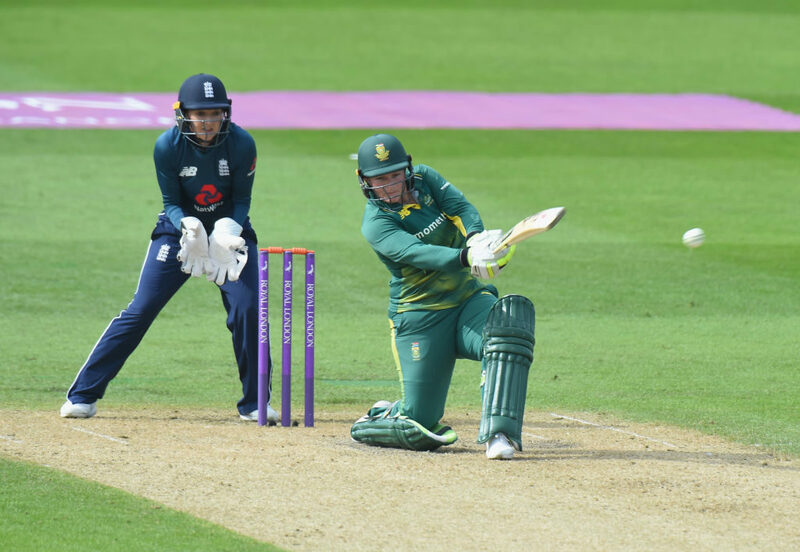 Lizelle Lee scored an undefeated 92 off 128 balls (11 fours, two sixes) to guide the Proteas Women to a comfortable win over their arch-rivals, the England Women’s team, in the first ODI in Worcester. Lee scored the winning runs by going down on one knee to sweep the experienced Laura Marsh over square leg for six. Lee received tremendous support from skipper Dane van Niekerk, who scored a power-packed 58 off 79 balls (with 10 fours and a six), as well as Mignon du Preez, who also ended undefeated on 36 off 57 balls – hitting five fours. The comfortable victory seemed pre-ordained from earlier in the afternoon when South Africa reduced their hosts to 97-8 off 34.3 overs, before No 7 Katherine Brunt put in a career-best effort with the bat to guide the lower order through the rest of their innings to post a relatively competitive total of 189. Brunt then struck early with the ball when the Proteas went in to bat, forcing award-winning opener Laura Wolvaardt to play on to her stumps with her score on two. Sune Luus was gone for a duck in the flash of an eye when medium-pace opener Anya Shrubsole drifted one down the leg-side. 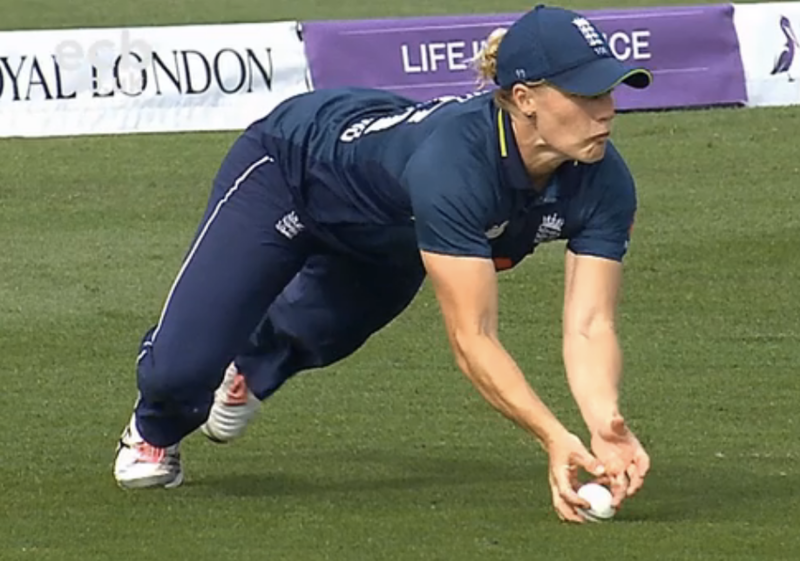 Luus fell forward in attempting to flick the ball down towards fine leg, her back leg pulling out of the crease and before she could ground her bat, England’s keeper Sarah Taylor had taken the ball one-handed down the leg-side and whipped the bails off. Luus was gone, the Proteas were 2-5 and it looked like the balance of power had well and truly swung England’s way. Undaunted, Lee and Van Niekerk took the game by the scruff of the neck, putting together 113 for the third wicket before the SA captain was deceived by a slower delivery from Shrubsole that she slipped out the back of her hand to rattle Van Niekerk’s stumps. Lee and Du Preez still had plenty of work to do, and Lee had a let-off with her score on 68 (and Du Preez on two) when Brunt dived forward superbly to catch a lofted drive down to mid-on. Lee was walking off the pitch when called back by the third umpire, who spotted that the ball had touched grass as Brunt lurched forward in an attempt to catch the South African opener. The pair took advantage of the let-off to take the Proteas to a comfortable win with time to spare, adding 75 runs for the fourth wicket to give South Africa a 1-0 lead in the series.